PLEASE NOTE THESE REVIEWS ARE FOR OUR B&B BASED TOURS AND NOT OUR VILLA-BASED TOURS. THOUGH NOT 100% RELEVANT, THEY WILL STILL GIVE YOU A GOOD FEEL FOR OUR VILLA BASED TOURS AS MANY OF THE ATTRIBUTES ARE THE SAME. WE STRIVE TO DELIVER QUALITY HOLIDAYS AND COMPREHENSIVE SERVICE ACROSS BOTH TOURS. Hard to imagine a better vacation cycling In France. Neil's bikes are fun and easy to master. The sat nav worked well and tolerated the odd detour superbly so going back to the planned route was easy. As for the hosts, Neil and family are warm and friendly - and made sure we got the most out of our stay. Watch out for Rocket the cat - a charming kitty but totally crazy. Peter & Frances - UK - Oct 2010. "We travelled to Provence for a short cycling break. The accomodation was great, with traditional Provencale accomodation and food to a high standard, a fastastic welcome from Neil and Natalene,and terrific bikes. The GPS on the bikes was brilliant, and made the tours very enjoyable. We would definitely come again - and probably will next year. Manon & Sarah - UK - Sept 2010. We were looking for an authentic experience of Provence and we found it in this 17th Century farmhouse. Friendly English-speaking host, Neil, bent over backwards to make sure we were comfortable and were having fun. The breakfast was wonderful and abundant with local fresh produce. 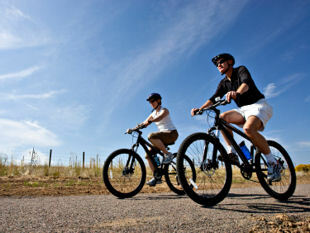 The location is convenient to the most scenic hill towns providing a variety of riding experiences. The best part was that each bike was equipped with its own GPS allowing us true custom tour routes. Just do it! You won't be sorry. Jeff & Lynda - US - Sept 2010. I am traveling with my 16 year old stepson and was not sure how he would adapt to life on the road, new customs and full days of cycling. Our stay with Neil and Natalene has turned out to be the perfect entre to France. Our rides to Isle Sur la Sorge, Fontain de la Vaucleuse and Gordes gave each day a sense of exploration and adventure and provided enough exercise to justify a happy excess of French bread and homemade jam for breakfast and Neil's sumptuous Provencal dinners. Add in Rocket the cat, two adorable kids (Lucy and James), the eclectic collection well traveled guests and the exquisite farmhouse setting and we could not have imagined a more perfect start to our trip. For others traveling with teenage boys, Trevor would like to offer that the cutest teenage girls are to be found in the market at Gordes. Barbara & Trevor - US - Aug 2010. "My husband and I are fit but really only neighborhood cyclists. We were a bit concerned about this adventure but could not recommend it more highly. We choose GPS guided tours that fit our abilities allowing us to enjoy the small villages, farms and local eateries. Neil and his wife were lovely hosts and good cooks. It was one of our most favorite holidays." Gary -֭ US - July 10. Exactly as the website said. 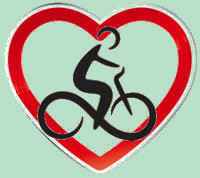 Great cycling in beautiful surroundings with some great places of interest to visit. Accomodation excellent and the host family were lovely. Equipment was ideal for its purpose and the sat nav's made life so easy. Very easy to get to by train so great for the environment too! All in all a perfect holiday. Pippa & Dave - UK - July 2010. I was looking for a cycling holiday where, as a single woman, I wouldn't feel out of place. I needn't have worried, Neil, Natalene, Lucy, Baby Jim (and Rocket the kitten!) all made me feel so welcome and the cycling was perfect.......I pedalled for miles every day through tiny hill top villages, fields full of lavender and sunflowers......it was bliss. And after a day's cycling it was wonderful to arrive back and relax by the pool and look forward to one of Neil's fabulous suppers. I will definitely be going back! 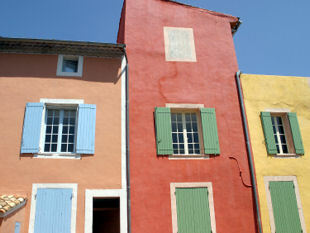 "My daughter (14) and I just returned from a perfect holiday in Provence. We wanted to do some cycling, but wanted more flexibility than what the other tours had to offer. Here, you could take off for a ride at your own schedule, travel at your own speed and stop whenever you felt like it...which was often as there were so many spectacular photo opportunities. The GPS system works perfectly and you can feel completely comfortable going out for a beautiful day of cycling. Neil has a complete menu of different rides to choose from, depending on the kind of challenge you want. Or he can create a route for you right on the spot. He knows the area so well and keeps you on beautiful, quiet, country roads. We passed vineyards, olive groves, lavender and travelled through beautiful Provencal villages. The B&B was a quintessential Provencal stone farmhouse, across from a cherry orchard with a beautiful view of the Luberon Mountains. " "As it wasour first cycling holiday we didn't know exactly what to expect but Neil made it all very easy with great bikes and great advice. Coustellet was a great base for seeing the gorgeous Luberon valley, a large selection of rides to suit all, which the GPS system makes stress free! Neil and Nat were very accommodatinghosts andthe property is fantastic. Highly recommended. We will definitely be doing some more cycling holidays as a result of our great first impression (perhaps the best compliment we can give)." Richard & Annette - UK - June 2010. "The cycling was fantastic made all the better by the GPS system and the route directory which is such a good idea. The alternative is to take a map and plot your route but I think you would find it hard to find the small lanes that Neil's routes take you down. He knows all the routes and will tell you first hand what to expect and how hard the ride is likely to be. And if you want a route that sets you a bit of challenge with a good restaurant for lunch Neil will point you in the direction and recommend the best places to visit. If you are into cycling or even just fancy touring the area a stay with Neil and his family really is the answer. Even if it's just for a few days or longer, there's so much to see and the area is beautiful. And if you want the ultimate cycling challenge you can travel to Bedoin and then head up Mont Ventoux, an experience which will stay with you for some time to come! Neil and his family are very welcoming and its very home from home, so you really can't fail to relax and enjoy the area." This was a wonderful place to vacation with my 13 year old son. The biking was wonderful and the scenery and location beautiful. Neil adapted routes to fit our needs and desires and went out of his way to make sure we were comfortable and taken care of. It was great to meet and dine with the Cowell family.